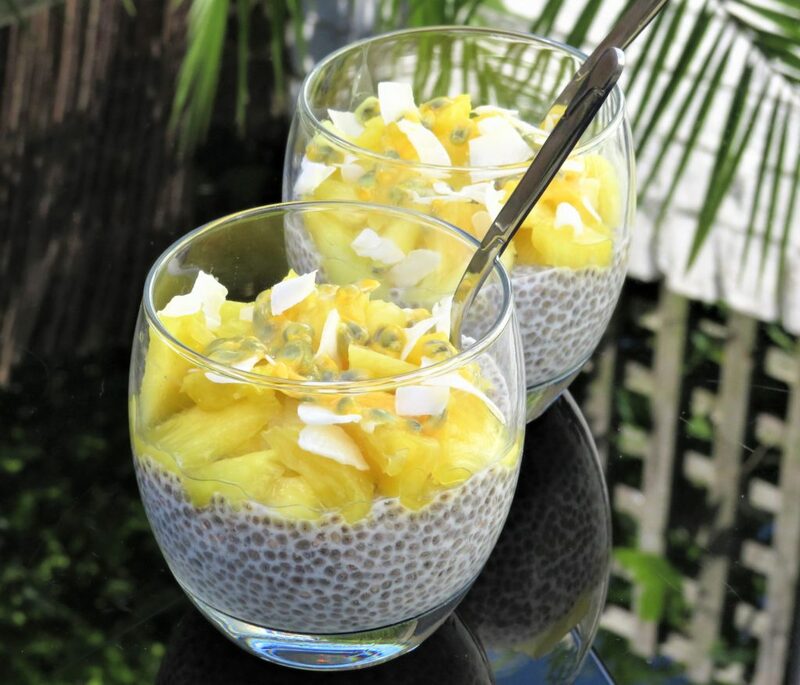 This is a little taste of tropical delight with these flavoured chia puddings. 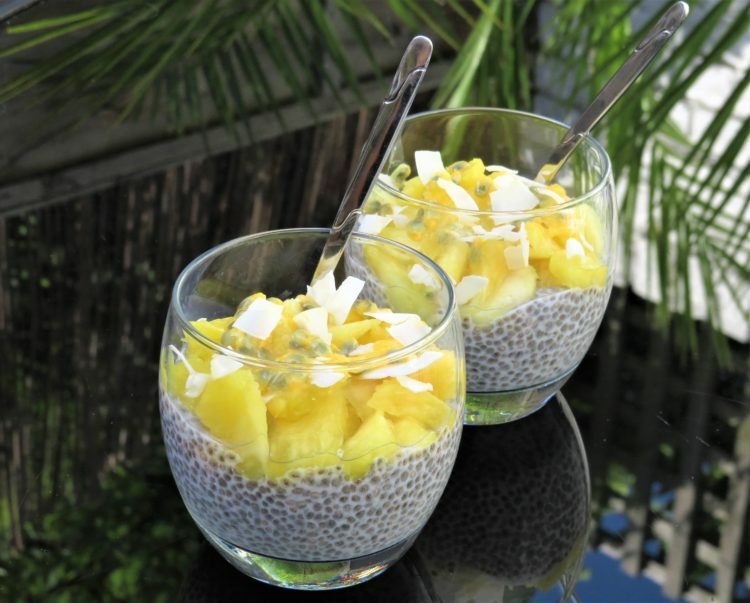 Chia seeds are packed with protein which makes these chia puddings perfect for a protein rich breakfast. If you have mini jars, with lids, you can make mini chia pud’s to take in your lunch box to have as part of your lunch instead of a yoghurt or you can have them as a dessert, they are very versatile. 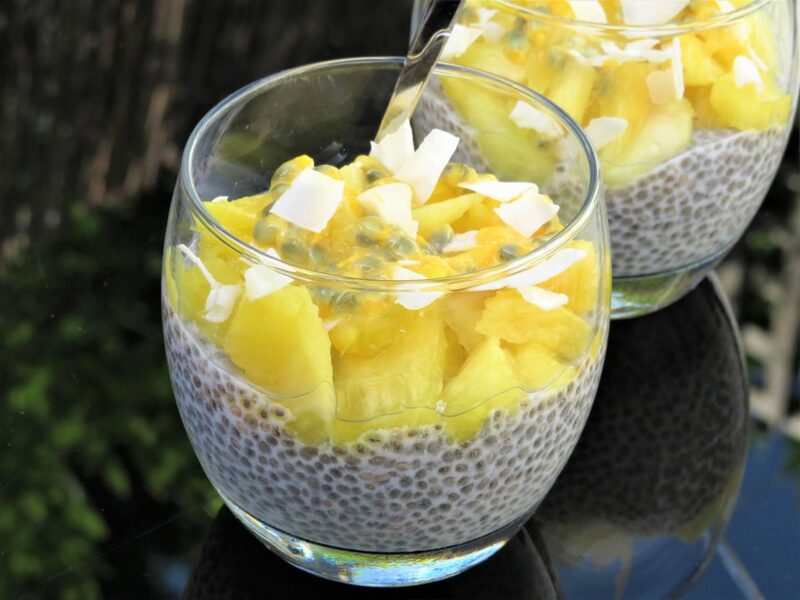 1 Pour the coconut milk in a jar and add the chia seeds. Then with a spoon give it a stir, cover and place in the fridge for 4 hours until thick. 2 After 4 hours remove from the fridge and stir, then pour into your chosen glass, bowl or jar. Cover and place in the fridge for 6-8 hours or preferable overnight to set. 3 When they have set remove from the fridge and uncover them. 4 Cut one passion fruit in half a scoop out the middle into the glass, bowl or jar on top of the chia pud’s. Then add with the pineapple on top, and cut the other passion fruit and scoop the middle over the pineapple. 5 Garnish with coconut shreds and they are ready to enjoy. Tip: The chia puddings can be stored for up to 3 days covered in the fridge without toppings and 1 day with topping covered in the fridge. Which makes these are a perfect dinner party desert as you can make them ahead of time. Passion fruit are rich in anti-oxidants and fibre. They contain high amounts of vitamin-C, vitamin-A, potassium, iron, copper, magnesium and phosphorus. Coconut is high in protein and saturated fatty acid which boosts good cholesterol in the blood which is good for your heart. It is an excellent source of copper, calcium, iron, manganese, magnesium, potassium, zinc and B-complex vitamins.